The Department of Academic Technology Services in the California State University, Office of the Chancellor (CO) has organized a free two-hour webinar on Supplemental Instruction (SI), a high-impact practice that CSU campuses are implementing in support of their Graduation Initiative 2025 goals. Julie CollinsThe webinar will feature Dr. Julie Collins, executive director of the International Center for Supplemental Instruction at University of Missouri-Kansas City and presentations from CSU campus SI programs. 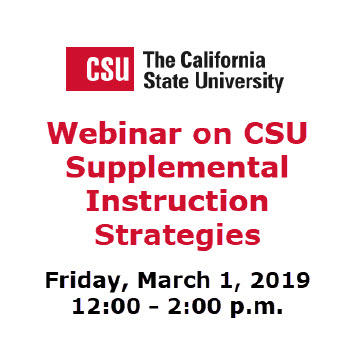 The webinar will provide a framework of successful SI, inform campuses as to planning, progress and assessment of SI effectiveness, showcase data and the impact of mature CSU SI programs and provide resources and networking through the CSU SI community. The webinar agenda is included. SI is an inclusive, non-remedial approach that provides regular review sessions outside of class. Students work collaboratively by discussing readings, comparing notes and sharing ideas for improving course material. Courses selected for SI are typically those with a disproportionately high number of students receiving grades of D, F and W. The CO supports an SI community that meets online to discuss best practices and progress within and across campuses. If you have any questions regarding this webinar, please contact Brett Christie, director, CSU Academic Technology Services at bchristie@calstate.edu or (707) 486-6519.